Here's What Will Get You Banned In Super Smash Bros.
During today's Nintendo Direct covering all things Smash Bros, the director of the game—Masahiro Sakurai—outlined the kinds of player behavior that will get you banned (or at least temporarily so) from the game. 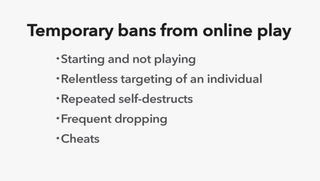 Good news for multiplayer players, who are accustomed to experiencing at least some level of some of these annoyances. And if this sounds like you, know that Nintendo is watching.